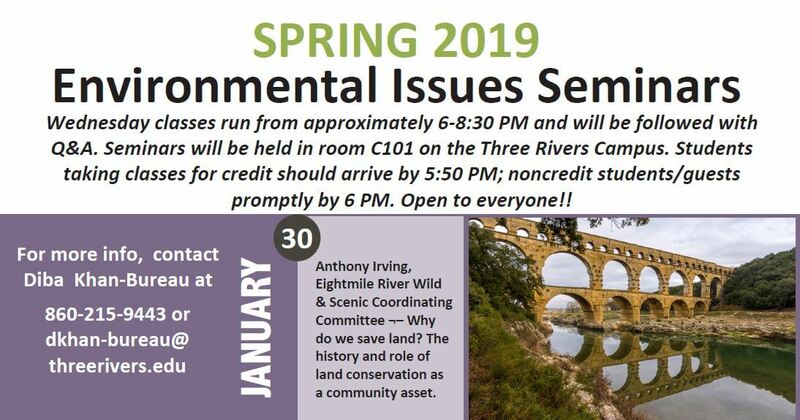 Wednesdays, January 30 – May 15, 6:00-:30 p.m.
Join us for fifteen free seminars on some of the biggest environmental issues challenging us today. Topics range from genetically engineer crops to the rise of plastics in the oceans and more and are taught by a range of experts in their fields. Seminars are held in room C101 at Three Rivers Community College on Wednesdays, from 6:00-8:30 p.m. Guests are encouraged to arrive promptly by 6:00 p.m.